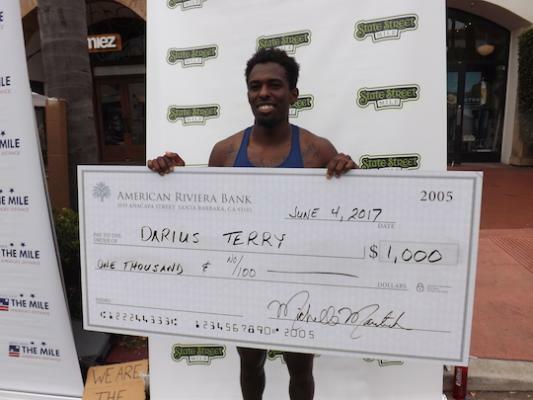 (SANTA BARBARA, Calif.) – (June 4, 2017) – On an overcast, cool Sunday morning, Tori Tsolis of San Jose and Darius Terry of Santa Barbara won the 18th State Street Mile, clocking 4 minutes, 22 seconds and 3:54 respectively, in beautiful downtown Santa Barbara. In a photo finish, Tsolis, 24, also set a course record by 1 second on the gradual downhill, point-to-point course. An event record 8 men went under the coveted 4 minute standard (old record was 6 sub-4 in 2013-14 and 2016). In addition, Ireland native Neville Davey, 42, Palo Alto, CA ran 4:00 to set a Masters (40 & older) course record and finished 9th overall in a field of 21. The Amputee Mile champions were Andre Barbieri, 36, Santa Barbara in 7:03 and Karen Aydelott, 71, San Luis Obispo, CA in 13:04 (repeat winner who broke her own event record). At the crowd-pleasing Platinum Performance Dog Mile, the unofficial world championship, Geoffrey Gray & Hank won in 4:37 (the pair also the race in 2014), while the female human-dog winners were Jill Deering & Abbey, a rescue dog (5:38). All four champions are Santa Barbara locals.